Written by an experienced instructor of business writing courses, Business Writing Scenarios offers a hands on approach that immerses students in the types of writing situations they will encounter throughout their working lives. Detailed guidance and numerous examples help students build the skills they will need to respond to these situations effectively. In each of the core chapters, students first learn how other writers addressed a particular writing situation—such as having to convey disappointing news to employees, explain a major policy change, or respond to a difficult customer—effectively or ineffectively. Students then apply what they’ve learned through guided activities ("applications") that ask them to respond in writing to a similar business scenario. Additionally, the book emphasizes the potentially serious consequences of ill-considered business communications, especially those delivered electronically. A chapter dedicated to business writing gaffes provides many real-world examples of these mistakes and advises students on how to avoid them. 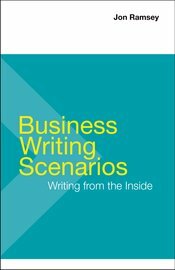 Suitable for use on its own or in conjunction with another text, Business Writing Scenarios is a useful addition to any course building students business writing skills.